Bennett Hall created WorldWide Archive to feature his collection of historical images, all produced at high resolution images, digitally mastered over the last few decades. This includes content centers on San Francisco and California, and from around the United States and the world. It is created from public domain, private, Bennett Hall's photography and his collection of images. Our clients include the US District Courts (All Northern California courthouses), Swiss Louis and Momos restaurant, Omni and Palace Hotels, Century Plaza Hotel, Hills Bros Coffee Exhibits (#2 Harrison Street - historical), San Francisco Bay Club, Nestle Beverage, Charles Schwab and Tristar pictures. 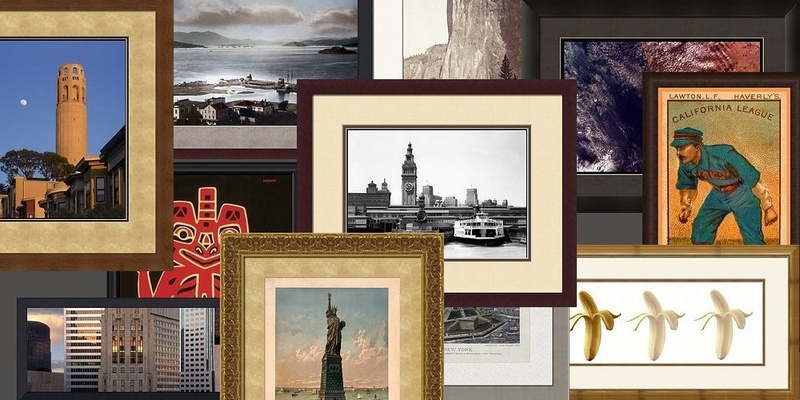 Our San Francisco/Oakland picture framing company is Eco Framing, and leader in sustainable custom picture framing featuring US-Made forested and milled moulding. We have over 20,000 feet of moulding in our facility at reasonable pricing. Volume and wholesale framing available for commercial projects as as well as personalized service for individuals. We have a variety of our one of kind finished pieces at this facility which we offer at outlet pricing. Hours: Monday through Friday 9:30-5:30 by appointments. Imagekind provides state-of-the-art gallery wraps with either a white, black or the image wrapped around the stretcher frame. Let me know if you are interested in the warps so I can make sure you get the best possible price, as the matrix on the Imagekind system does not allow sufficient customization for canvas wraps. Imagekind's customer service team can also assist if you need precise sizing not listed in the charts or other services that may involved special pricing. Call the main number - selected Extension 3- ask for Tracy. On-site design services, art consulting, content development, custom photography, educational signage, custom framing and installation, Rights-managed licensing.